Announcment made that the pack’s 18th anniversary and meeting will be held February 25th, 2019 – All Day! * Atraya it would take her no time at all really to reach the clearing itself after she had forsaken her, what seemed, temporary oasis from the usual day. A long breath escaped her as the cold touched her lungs causing her to shiver with what pain and discomfort it caused her. A low breath was given as she exhaled deeply in hopes that it would warm her frigid insides. The sound of snow hushing across her paws was made as she would feel the gentle caress of it’s powdery substance across her legs as she would finally reach the clearings edge. Once she was there she gave but a moment to look and see who was around before walking towards the Alpha’s rock. The distance from the eastern ancient forests to the Alpha’s rock was very little. Depending on who was there they might see her lithe, silvery white frame making it’s way to it. She was like a living ghost cascading across the landscape in silence. Once the boulder was reached she would take but a moment to observe the antiquity it held and the changes it went through with another season come and gone. Winter was now behind them and spring soon on the horizon, she hoped. The weather would be warm and easier upon her frame she thought. The sounds of her nails clicking against the stone would resound as she would make her way slowly to the peak and stop at the very edge. Oh curse the stone for it was cold to her paws. Discomfort would grimace across her face for but a moment until she finally settled down upon her rump, wrapped her tail like a blanket around her paws and there lifted her muzzle skyward howling for the beginning of a meeting. Just as her voice would touch the skies snow flurries would start to fall from the dark clouds over head. They where very light and airy. Much like you would find in a fairy tale in the humans books. * Darth heard a howling coming from behind him and decided to pick up the pace as he trekked to the southern forest. * CwnAnnwn heard the familiar summons for a pack meeting. He turned his frame towards the Alpha’s rock before slowly picking his way closer, gaze shifting between those present as he pushed deeping into the gathering place. Large paws splaying with each step, keeping his legs from pushing too far into the snow, enabling him to move unhindered. * Kova would turn an ear towards the sounds of a call that she had not heard in sometime now. It would be bitter sweet to her ears and the welling excitement that still held true to the greeting of her sister now held true to the prospect of a meeting. She would quickly nuzzle tug at her sisters coat as if to pull her along to join the meeting. She knew that her rank was far beyond her own now and she would tuck her head down slightly to ensure that this new wolf knew that Shukie was of importance. It was there she would start to make her way towards the center of the clearing where most gathered for a meeting. She glanced around her for Ayaka, having not seen her in many months, a frown played along her muzzle as she fae was not spotted and so thus she turned her gaze to the stone and the lithe figure silhouetted upon it. * Kwa`ani heard her mother’s vocals and the call to assemble. It was a call she couldn’t ignore, on multiple levels. Moving toward the stone, her frame low to the ground, snout just above the snow’s surface. Her eyes shifted side to side to catch any shadows moving but otherwise her focus was to the north where Atraya sat upon the stone. * skydancer longer covers her whole leg as the scar tissue from her,.. encounter seems to have prevented the regrowth. * Shukie followed along beside her sister, playfully tugging back at her scruff while she was afforded the chance. Pausing when her sister would she nuzzled and licked Kova’s muzzle, eyes seeking out the owner of the male scent then responded to Atraya’s call with one of her own as she would near the alpha stone, dipping her head in greetings before taking her place beside the stone, gazing out at those arriving. * Noshoba gently nuzzles his granddaughter that was starting to look more and in some ways worse than him. ” Youngin you really need to chose your battles carefully” Falling in with her pace to make way to the clearing. * Kova would offer Shukie one last nuzzle before she took her place at the Alphas rock. She too seated herself in the snow and glanced up momentarily as the flurries fell from the sky. She enjoyed the snow and would be plump still with a wintry coat so it bothered her none. She would now listen intently to what Atraya had to say. * CwnAnnwn located a spot near those whom had gathered and settled upon his haunches. His thick tail wrapping around his legs as he drew his attention to Atraya as she began the meeting. His ears flicked atop his head as he picked up the sounds of others shifting and settling in for the meeting. * Shukie ‘s ears perked to the alphess, nodding to those who heeded the call as she waited to hear what was to be announced. Several she’d not seen in some time her tail thumping briefly as their scents came to her then stilled when Atraya spoke. * Kwa`ani would look more like a small fallen tree in the snow. As quietly as possible she moved to join the others only nodding should another catch her eye as she focused upon Atraya and what she was saying. * Kwa`ani didn’t know if she was still part of the pack or not which caused her to hesitate tho she lifted her head to gaze directly at Atraya. Still hesitating she instead spoke from where she was at, “I have been gone a while and do not know if I am still a pledge or if I need to requset again?” as she spoke her head slowly drooped lower, tail curled under and ears pointing down as well. * Kova would look aroud her quietly not seeing many in the way of new wolves save for Darth. It was there she turned her gaze back to her alphess. * Atraya when the voice reached her it was familiar albeit different. More grown. She would look across the horizon towards the wolves who where present to see her daughter, Kwa`ani, among the gathered. She herself hadn’t been rightfully present but would offer a gentle dip of her head and chuffed for Kwa`ani to step forward. * skydancer quietly moves to the front before sitting down and turning her attention toward the alphes. * Noshoba allows her to leave his side as he did not the heirachy anymore and quitely allows haunches to come to rest. * Shukie smiled at the young fae, young.. she was nearly 3 now. The pup was an adult now and showed far more maturity than she had several months back. Her head dipped to the fae tho made no other movement or sound. The restless silver furred male caught her attention. He seemed familiar until at last recognition set in and dipped her head to him. And there was an elder present as well which brought a smile to her muzzle to see he’d survived winter. * Kwa`ani shifted slowly, rising at last and moved towards the alpha, surprised at her nervousness. Her mum shouldn’t make her nervous should she? Shaking away the strange sensation she stopped before Atraya. Now she stood tall, taking in a deep breath letting it out slowly. * Atraya when the young fae would approach she would smile to her daughter and dipped her head “Kwa`ani… you have been a constant presence within the pack even though you’ve been elusive, much like myself. I would like to ask you… do you still desire to call WolfSpirits your home?” perhaps a more formal “welcome back” is what she was making but her tone would still hold true to the curious nature she asked all wolves who desired to join. She would wait patiently for her response. * Shukie gave her full attention to the proceedings and Atraya. Her eyes scanned those present once more before settling back on Kwa`ani, a slight inclination of her head to the fae, curious to her response. * Kova her hues fell towards the alpha’s daughter, Kwa`ani and she would smile to Atraya’s question. She would now turn to her listening intently for her answer. * Noshoba watches patiently from his spot after giving a respectful nod to Shukie at her noticing his presence. <Kwa`ani> Â»Â» formalize my place here.” her tail had uuntucked some and her ears were mostly forward tho twitched now and then as she awaited the alpha’s decision. * CwnAnnwn caught movement from his peripheral vision, he turned his head slightly to look towards Shukie and acknowledged her with a nod of his own before turning back to Atray and Kwa’ani, his own mind running over his own decision. * skydancer ears draw slightly forward as she shifts her attention to kwa’ani as the younger fea steps forward waiting quietly for the response she knows must come or else the alpha’s daughter wouldn’t havecome forward, which reminds her of something and she checks in a calm inconspicous motion to see if any of the fae’s litter mates might be around. * skydancer before shifting her full attention back to the proceedings. * Atraya with her response she would offer a nod of her head before she would offer in lighter tones to the words she offers from her heart. Who among them doesn’t wander? “As all who lay witness to Kwa`ani’s words, her pledge, I would then like to have the honor of renaming you a pledge once more to the pack Kwa`ani. You may introduce yourself as such to those you pass and cross along your journey. If you feel as though this is something you do not desire, allow this time to pass and ensure this pack is truly your home.” her paw would slowly rise and come down upon the cold stone as she made it so for Kwa`ani. * Noshoba notices his other still present granddaughter and gives her a soft smile. Banner landscaping the snow with a few affectionate passes. * Shukie smiled as she watched the proceedings and from her position noticed another shadow arriving. Her attention came back to the proceedings, “Welcome home, Kwa`ani.” Her own paws trompled the snow briefly then settled once again. * Kwa`ani let out a long breath of relief having learned not to take things for granted, “Thank you, my Alpha.” She dipped her muzzle to the Beta as well before scampering back with the others. It was then she noticed the silver wolf and an older fae but quickly brought her attention back to the Alpha. * Kova would smile, letting loose a few barking chips towards Kwa`ani! Happy to have the fae rejoin them once more on the journey to joining the pack. * Kova an ear perked to the mention of the herds and she would lower her head in quiet thought, perhaps some how feeling responsible in some manner over the hunts not going on as often as they should but the prey was not there. Perhaps any other regular pack would’ve moved on and went where the hunt was but that option was not presented as such. Even with few numbers they had, they could survive on the smaller abundance of prey here. Quietly thinking to herself she would suddenly be jarred out of it upon the ending of the alpha’s words and mention of the seasons change. She tilted her head some and wrinkled her nose at the thought. She recalled this time of year and didn’t much care for it. The tension was enough to drive anyone to be alone. * skydancer gives a slow dip of her muzzle at atraya’s words her eyes growing serious for a few moments not the she needs reminder but some of the younger ones might shifting her attention toward shukie she waits patiently to see if the other has further information. * CwnAnnwn gave a quiet chuff of congrats to the fae before turning back to Atraya as she moved on with the meeting. He listened silently as she spoke, paws shifted beneath him to get more comfortable. * Shukie was in the middle of a nod when Atraya addressed her directly in hushed tones. At that she stood and looked ot the others. “We have elders present to look after and ensure they do not go hungry. The rest of us have healed, likely as much as we will from the most recent battle. Let us work as one group in all aspects or hunting, guarding, tracking and caring for each other. 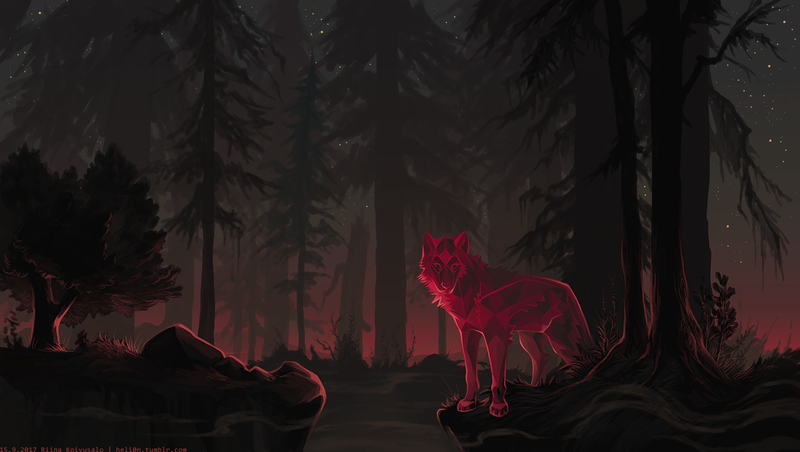 Be wary of any new wolves, especially strangers over the next month or two.” adding her own caution to the Alpha’s, sitting back upon her haunches, mentally assessing those she knew were about the area again. * larka nodded tovshukie at her words and then looked to nosh ” none except akua and sinopa. The joys of my heart. They would be 9 now” she would let out a small whimper as she stared back at the alpha rock. * Kwa`ani cast glances to those around, taking in the different scents on the breeze. She wasn’t sure what Atraya and Shukie were so up in fur about. She wasn’t used to being around others and in time realized she had not affirmed the leader’s cautions, nodding to each but not knowing what the problem was. * Kova let loose yet another huff at the thought of tension, perhaps why she treated it as such in her mind having not much positive reinforcments to think otherwise. She was, however, happy to know the feeling of warmer weather on the horizon and the potential young to prey upon. Her mouth salivated a little and she grinned before she resumed to glance up at her alpha and beta. She would dip her head to Shukie and to Atraya and their words. She herself had nothing to add. She will do her part and hunt for those who where present, including the elders. * Shukie didn’t want to broach the subject of the landscape changes and the now easy passage to the northlands after the earth shakes not all that long ago. As Atraya closed the meeting she stood with a dip of her head to all present, tail wagging now at seeing more of her family than she had for some time. Her memory easily recalled CwnAnnwn’s scent remembering he was one of the first to meet her so long ago. Previous PostWolfSpirits 17th Year Anniversary!